Unless you’ve been living under a rock, you’ve likely heard of fusion food by now. But you might not know exactly what it means or what to look for when searching for a fusion cuisine restaurant. Tony’s Grill is a Pahrump, NV restaurant and we serve local fusion treats. We’ve pulled in the best of American, Mexican, Asian, and Italian foods to bring you the cream of the crop when it comes to our menu. Check out our menu and come visit us at 2610 North Blagg Rd. today! What is fusion cuisine? Read on to learn more! The culinary is, so to speak, a big melting pot of cultures and ideas. If you can dream it, you can probably cook it, and, of course, eat it! Some examples are Italian-Chinese fusion, Mexican-Italian fusion, Mexican-Chinese fusion, and so on. For example, you can create a pasta dish with traditional Italian ingredients but mix in Mexican ingredients like chorizo. Cooking styles and preparation techniques can also make a dish fusion cuisine. One such example could include a chef who was trained in Italy who prepares traditional Mexican dishes using Italian techniques. She might not use Italian ingredients, necessarily, but her methods for preparing the dishes could give the Mexican dish an Italian flair. 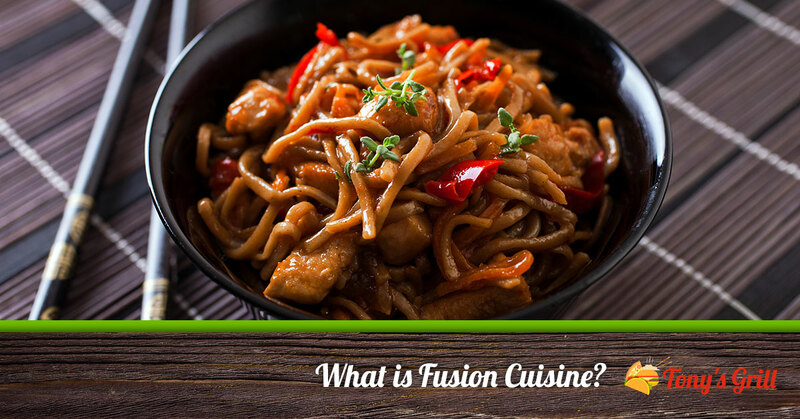 Fusion is the application of heat to create a new substance, which is why it’s perfect when used to define this type of culinary style. One thing that makes it so unique is that it’s not only the ingredients and cooking styles, but the degree to which the chef incorporates them. The techniques might be done subtly, with a spice or a method of searing meat that isn’t in-your-face noticeable. But where one chef might choose to tease out nuances, another might decide to go for a more explosive level of fusion, creating a bright, succulent dish that’s unmistakably fusion. At Tony’s Restaurant, we’ve incorporated elements from our four favorite cultural cuisines: American, Italian, Chinese, and Mexican. Our menu is the result of many years in the restaurant industry, and when combined with the freshest locally sourced ingredients, there’s no other place to look for Pahrump, NV restaurants. You’ll love our dishes, as well as the fact that you can entertain an entire group of people with varying food preferences all under one roof. When you want to check out the best restaurants in Pahrump, be sure to come by Tony’s!